Fiftieth Biafra anniversary: MASSOB, Security Agents hold processions in Imo – Royal Times of Nigeria. 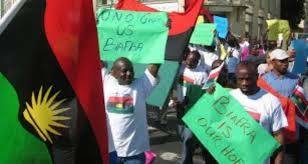 The residents of Owerri, the Imo State capital, were in the early hours of today thrown into a surprise, as members of Movement for Actualization of Sovereign State of Biafra, MASSOB, its sister group, Indigenous People of Biafra, and combined security agents staged separate processions ahead of the May thirtieth “sit at home” order by the pro-Biafra agitators. While security agents comprising the Police, Nigeria Security and Civil Defense Corps, State Security Services, Army and Airforce processed across major streets in Owerri and other parts of the state, the pro-Biafra activists staged a street protest across the state capital ahead of tomorrow’s fiftieth year Biafra anniversary celebration. Amidst cheers and ovation from residents who came out to watch them, the MASSOB and IPOB members, demonstrated, clutching various Biafra insignias. Surprisingly, they did not clash with security agents who were equally on separate procession . 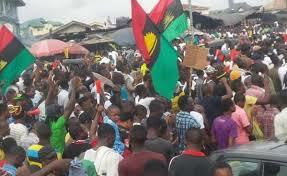 Speaking to newsmen later, MASSOB leader, Uchenna Madu, said that by the procession, security Agents were helping his organization to make the May thirtieth celebration a huge success.